Carla is hosting this challenge and I thought I would like to participate. My answers are in red. 1. Choose a financial goal for the month! I hope to stay under $75 a week on my grocery bill. That in itself will be an achievement if I can do that. I already added a little extra to our weekly mortgage payment last month so can't count that. I also want to add money into our savings account and will aim for an extra $200 for the month. 2. How will you achieve your goal this month? By actually writing a shopping list and sticking to it. Using as many coupons where and when possible. Checking out the half price racks. Menu planning. Checking all the flyers and shopping for sale items. 3. How will you allot your spending this month? I take a specific amount of cash out of the bank each week. Once that money is gone it's gone and we have to wait until the following week. 5. Are there any “exemptions” for the month? - Do you have any previous engagements, birthdays, events, etc.. that simply won’t fit into the month? Then choose your exemptions & plan from there how you can still reach your goal! We have five birthdays and a wedding this month. Luckily four of those birthday's are just birthday cards to be sent, but one is a special birthday and I will be purchasing a gift and it will have to be put on my credit card, as it's for a family member in Britain and it will be sent directly to them. The wedding gift is cash and I saved that up over a period of six weeks @ $50 a week. Yes a standard wedding gift now is $300 a couple, and I spent another $150+ on a Bridal Shower gift. Oh and Valentine's Day is on the 14th!! I do need to buy dh a new shirt for the wedding, but hope to pay for it out of the money I take out of the bank weekly. Also I must buy dog food this month and that is $90 a sack that lasts around 6 weeks, have $50 put aside for that, so only need to come up with the other $40. 1. There will be 4 main challenges for the month. I pick the theme, you pick the challenge! Our bedroom closets and drawers. Living room wait until you see the before photos with that one!!! The ruddy old basement.......this is a big job!!! - I will be giving you 4 *bonus* mini challenges throughout the month! Fast & easy to accomplish! Oh joy!!!!! - Toss, sell, or donate 29 items! One item for every day of the month in February… Easy as pie! Now the only thing that will throw a spanner in the works is if I get my hand operated before my February 28th operation date. I am on the cancellation list, and if I get called I will go in and have it done earlier. That shouldn't affect my low/no spend challenge, but it could affect the decluttering challenge. Just thought I'd mention it. I decided to sit down on Monday afternoon to go over how we did financial wise during the month of January. First my pots; I have $200 in my birthday pot. It would have been $220, but I took $20 out last week to buy 6 cards and 6 stamps for Britain. 5 of those cards are for birthday's in February, and I need three of those stamps to mail the cards. In the "Other" box I have $350, but $300 of that is ear marked to put in the envelope for a wedding we are attending at the end of February. The Christmas box is looking healthy as well with $140 in there. Just checked my loonie ($1) and twoonie ($2) box and I have $57 in there. Hoping to have $200 in there by the end of April, using that money for the garden. Both dh and I have been putting any silver coins into my sealed pot, but it's a bit of a double edged sword situation. As we trying not to spend any money, I never have any change. I know I put over $1 worth of silver in there today though, so that's good. Grocery Shopping: I went slightly over budget this week and spent $79.67 and used $18.49 in coupons. So my monthly total came in at $293.73 which was under my $300 budget and used a total of $75.37 in coupons. I also managed to increase my Shopper's Drug Mart points total by 39,740, which is worth $60 in free product on a regular day. This week I stocked up on deodorant for dh, more shampoo for me and new toothbrushes for us for the end of February. Due to me going shopping on Monday morning, I discovered that most things were out of stock, so I had to adjust my grocery list accordingly. I am hoping to have enough swagbucks to cash in again by January 31st, so that will be $25 worth of Amazon e-cards this month. Not sure if I can keep this up though when the weather gets better. We have started a glass jar with a label on it saying "WINE FUND." Dh likes to make wine and it is a lot cheaper than buying it from the LCBO. It costs around $120 to make around 30 bottles of wine at the store. I told dh I would contribute $20 a week, as long as he contributed $10 a week from his "allowance." So far there is $60 in the jar, so in a couple of weeks there should be enough in there to start a batch. I think I will encourage dh to keep putting $10 a week in there to start a batch after that. I put an extra $10 a week on our mortgage payment, and am toying with the idea of adding an extra $10 to that. Every little bit helps to my mind. It's been a quiet month for renovation expenses and I think this month we only spent around $250 at the hardware store. Money was put into the savings account each week, not a lot but better than nothing. I earned some money this month, which helped out a lot as I had a big credit card bill (all paid off). So my standard goals for February are to continue adding money to all my pots. There are four Fridays in the month of February, so I will set my grocery shopping budget to $300, or $75 a week. Try and keep my spending down and only eat out once during the month. I will be posting the rest of my goals along with my Challenge goals tomorrow. With what I had in the fridge and what needed using up I decided to make up a pound of pastry on Sunday and make a quiche, egg custard tart and some jam tarts. To make the pastry you need 1lb all purpose/plain flour, 4 ounces each of margarine and lard/vegetable shortening, pinch salt and some ice cold water. Mix flour and salt together, rub in margarine and lard until it looks like breadcrumbs (?) add enough water to bind it together and then let it "rest" for half an hour or so. Super simple and straight forward. Place the flour, butter and salt into a large clean bowl. Rub the butter into the flour with your fingertips until the mixture resembles fine breadcrumbs, working as quickly as possible to prevent the dough becoming warm. Add the water to the mixture and using a cold knife stir until the dough binds together, add more cold water a teaspoon at a time if the mixture is too dry. 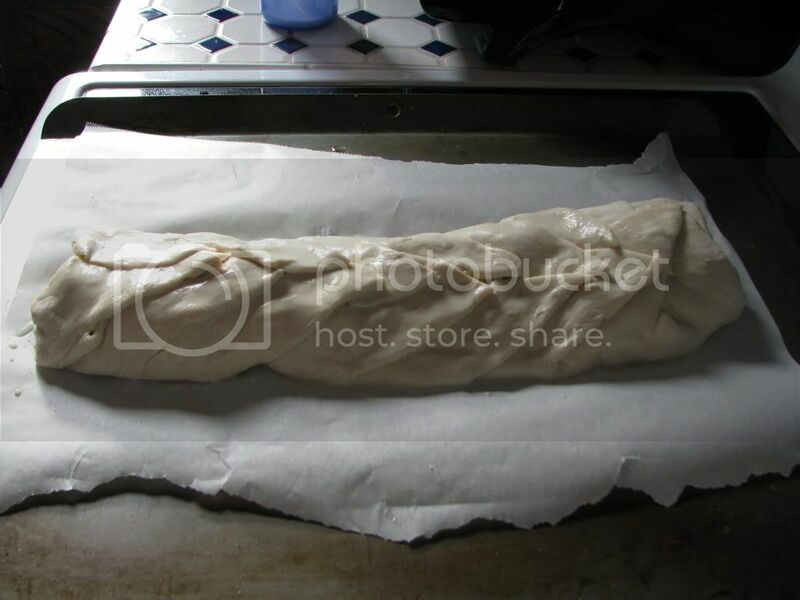 Wrap the dough in Saran wrap/Clingfilm and chill for a minimum of 15 minutes, up to 30 minutes. Gently roll the pastry and line a 1½"/4 cm deep, x 7"/18 cm base tart tin. Be careful not to over stretch the pastry whilst rolling or the it may crack in the oven. Brush the pastry all over with a little of the beaten egg. This will help seal the pastry during cooking. In a large bowl beat the eggs and egg yolks lightly with the sugar. Warm the cream to a gentle simmer, then pour slowly over the beaten eggs, stirring constantly. Be careful not to overheat the cream or it will curdle the eggs. Add the vanilla extract. Pour the egg and milk mixture through a sieve into the pastry case. Sprinkle over the grated nutmeg. 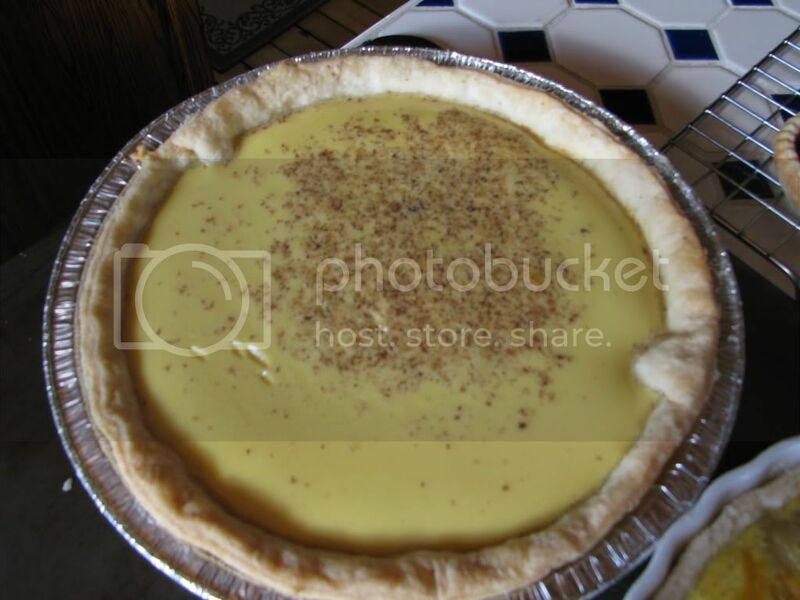 Place the tart onto a baking sheet and bake in the center of the preheated oven for 10 minutes to brown the pastry. 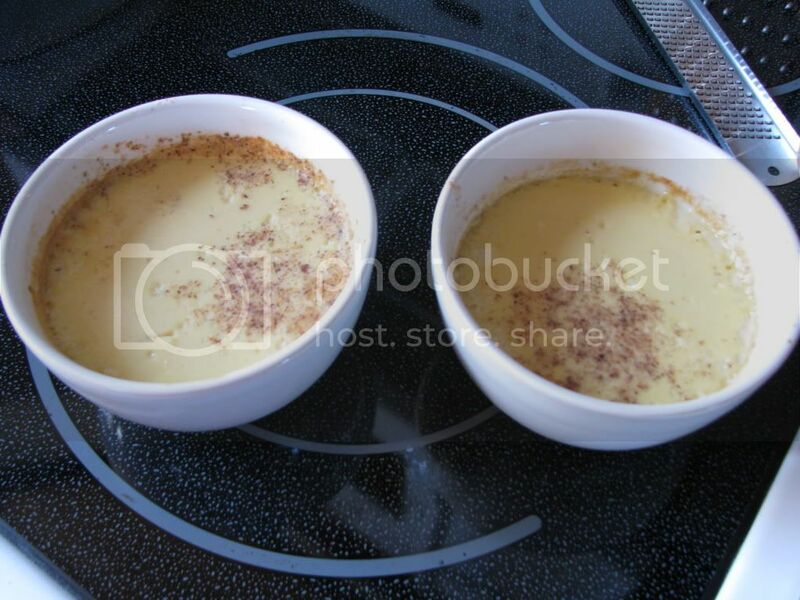 Lower the temperature to 350°F/180°C/Gas 4 and continue cooking for a further 20 minutes or until the custard is set. Not sure what I did or didn't do, but I ended up with too much liquid, so I put the extra into two small bowls and set them in a dish and poured boiling water half way up the sides and cooked for 20 minutes. So egg custards without the pastry. To make sure I had the oven full I also baked some potatoes at the same time, to go with the quiche and salad we were having for supper. 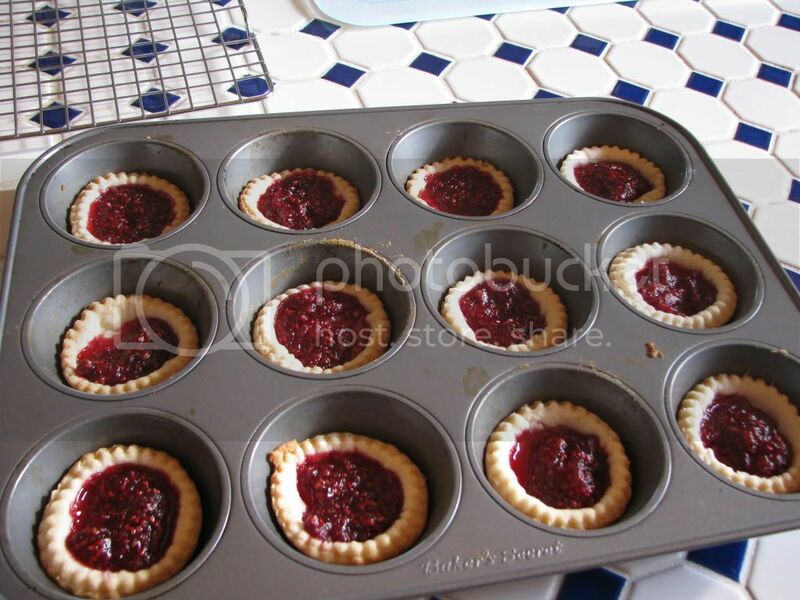 Oh and I had enough pastry left to make dh's favourite jam tarts!! 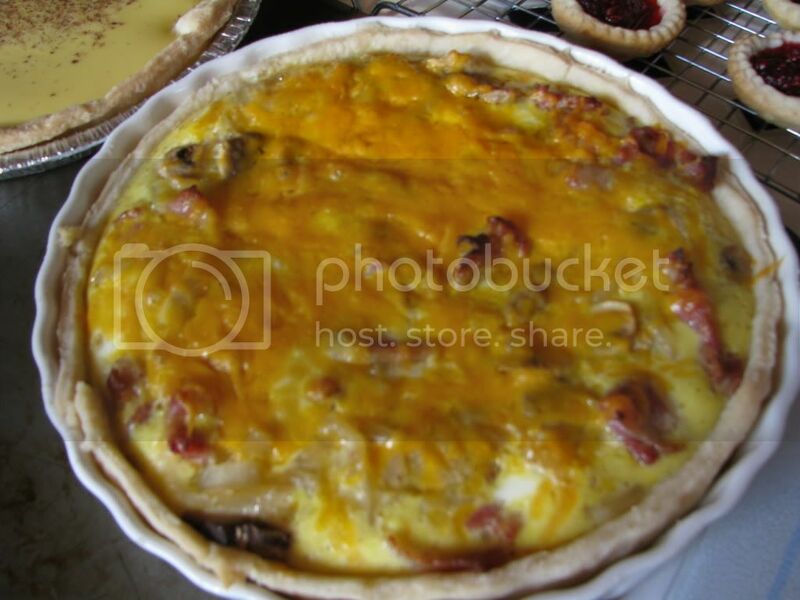 I put bacon, onion, mushrooms and cheese in the quiche with four eggs and enough half and half to make around 3/4 pint/ 1 1/2 cups of liquid. Everything was baked at the same time other than the custard cups. I didn't have room in the oven for them originally, so had to cook them when all the rest of the things were done. To all my new followers, a big thank you as well, I would love to get above 300 followers, that's my next goal. 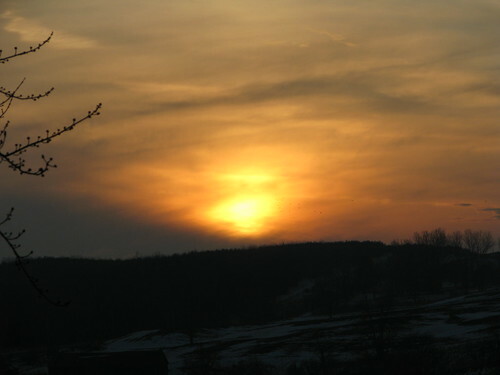 I have set myself a challenge which will be good for me, and that is not having anything to eat after my supper. I have a habit of snacking while I am watching tv, which is a bad habit. It's been nearly a week now and although I have had the urge to snack I have been good and haven't. It's not a lot but it's a start. I also want to cut out having a snack in the afternoon next when I have a cup of tea. I'll start on that next week, as having a cup of tea generally means having a cookie or a piece of cake. I am taking baby steps and don't want to tell myself I am going on a diet, as that will totally put me off and I won't do it. It's a mind game thing with me, because as soon as I think of the word diet, it means I can't have anything to eat. So I will try it this way to see how things go. 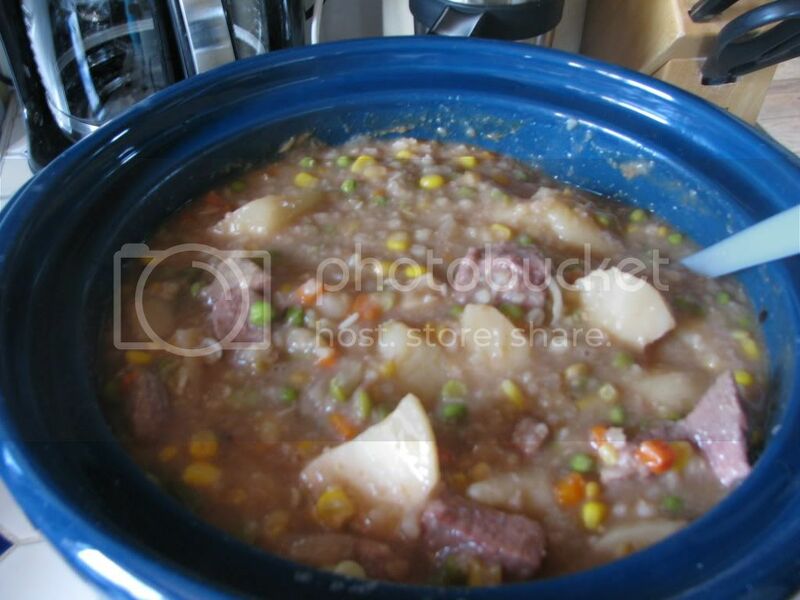 Cindy posted a good recipe on her blog the other day. She actually posts good recipes on her blog most days. 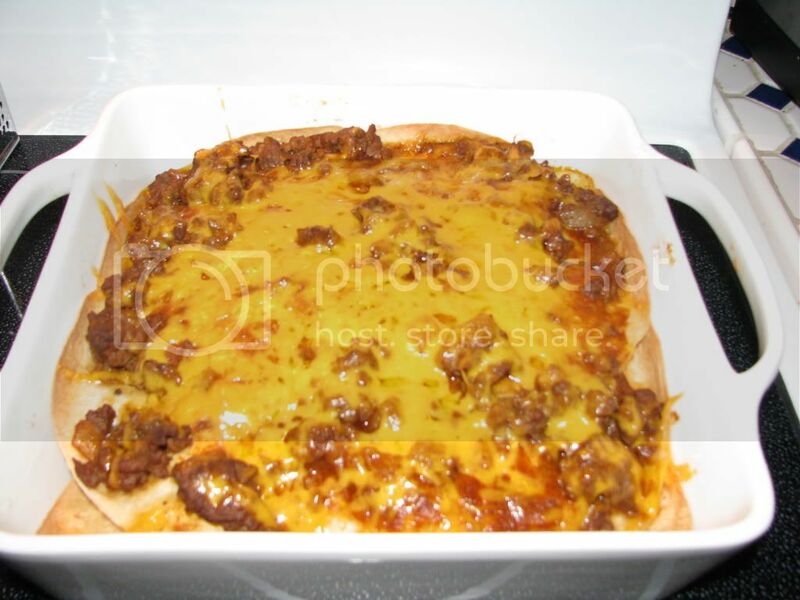 Anyhow, I did "my version" of her recipe by using and Old El Paso Taco kit instead. It was not too bad, I didn't use the full seasoning package that came with the kit as I find it too spicy for me. 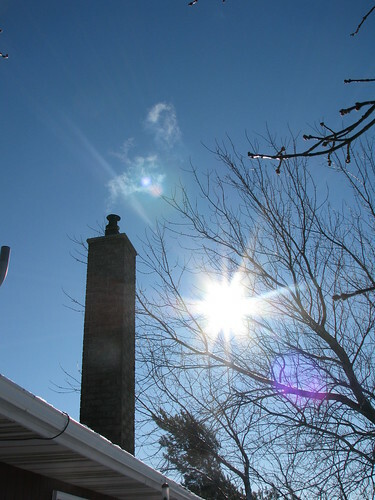 This is what mine looked like, click on the link above to see what the original looks like. I know no low calorie, but remember I'm not actually on a diet per se!!! Why I bulk buy certain things and other bits and bobs. i have decided i had better not try any of those recipes just in case as i only have a weeks supply of toilet roll in ! they cant be that good if the author needs a back up supply like that ! just how long does it take to get over each one ? That was in reply to this post. Now I know he was joking around, but I'm not sure he understands why I do what I do. So I thought I'd explain. I mentioned in that post I had enough toilet paper stocked up for six months. On that shopping trip I picked up 4 packs of 12 double rolls of toilet paper, which should last us 4 months, if not more. Generally I think they cost around $5.99 to $6.99 a package (they may be more I never pay full price). So we'll use the $5.99 price here. They were on sale for $4.99 per package and I had a $1 coupon, so all in all I saved $2 per package on the regular price, saving me a total of $8. Another thing we use a lot of is I Can't Believe It's Not Butter. We average a 1lb tub a week. It is normally around $2.49 a tub, but comes on sale every three to four month at $1 per tub. 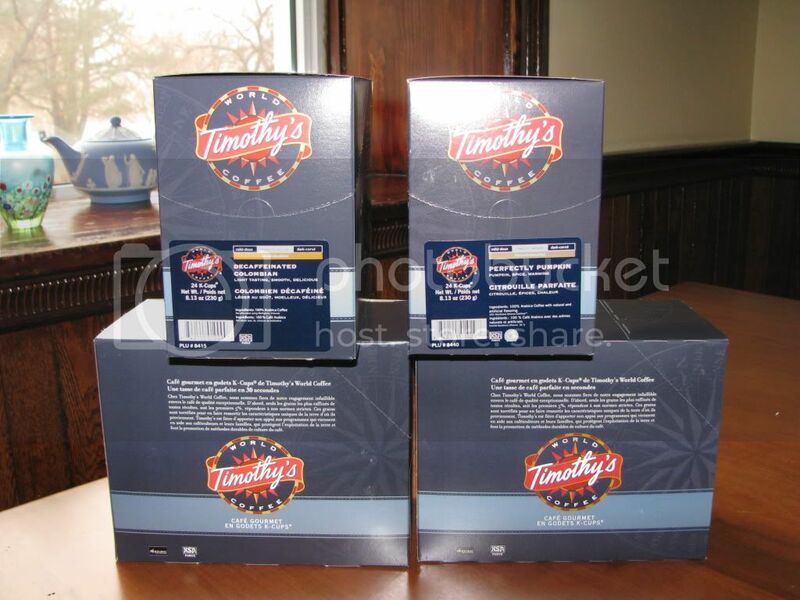 I generally stock up and buy 12 tubs at a time, which will last us 3 months. By buying them on sale I save $18.88. So just on those two items alone, which we use and a regular basis and I have room to store I have an extra $26.88 in our pocket. Granted if I had a very small fridge and no room to store these items I couldn't take advantage of these deals, but I am lucky enough to have both. What this means though, is that if a nutritionist looked at my weekly grocery shop it would be very unbalanced as I will buy things on sale, so some weeks it looks as though I haven't bought fruit, where in reality I already have fruit in the fridge or freezer from a prior week when I stocked up on it when it was on sale. I have been shopping like this for years and wouldn't do it any other way, as I hate paying full price for things, especially food. Also this system works for me, and I am happy with it. Do you want free onions, see this post over here. I have never heard of doing this before, but when I next buy green salad onions, I'll give it a go. Also cathy@home grows potatoes from potato peelings, see this post. For more detail on how to do it read this I think I will try this, this year. Swagbucks is a great way of earning free things, in my case $5 Amazon.ca gift cards for being on the computer. If you live in Britain, the States or Canada, you can participate. I have now earned $500 in Amazon.ca gift cards since I signed up in December of 2009. Well this week's "Home of the Week," is well.........um.....I actually don't know how to describe it.....I know a few boxes on stilts. I actually could probably afford this one, which is a first, but never in a month of Sunday's would I buy it. How on earth it got planning permission is beyond me for one thing. Also it says a couple with two kids want to buy it. Any ideas where the two kids will be sleeping? As always read the comments, always an eye opener!! The "Condo of the Week," as always over priced. First the good points, just love the terrace, I mean look at the views. That photo at night with the CN Tower lit up was rather neat. Now the negative points. Who in their right minds wants a shower two feet from their bed? Also when I go to the bathroom I like privacy, don't you? The kitchen is an accident waiting to happen with that step; why would you put a step in the kitchen in the first place? The living room reminds me of a bowling alley; it is not decorated for people to live in, it rather reminds me of a very upmarket doctors waiting room? Think I'll pass on this one as well. The flyers came on Thursday, so I looked through them to plan my grocery shopping trip this week. It's going to be on Monday as I want to take part in the bonus points deal at Shopper's Drug Mart that they are having Monday through Friday of next week. If you spend $50 BEFORE COUPONS you get a bonus of 8,000 points. My total before taxes and coupons is close to $51. After taxes and coupons it will be $37.85 or there abouts. I will be getting us new tooth brushes, toothpaste for dh, and deodorant for dh, plus a number of other things. They have eggs also on sale for $1.88 a dozen on Sunday and Monday, so make sure you use your $1 off coupon. Milk is also cheaper for me there at $4.19 a 4 litre bag. The other place I am going is the dreaded Wal-Mart as I can price match other stores there and it's reasonably close to Shopper's, so have a list of things I want to get. I am just hoping they will have everything in stock on Monday morning; I'm not counting on it though!!! 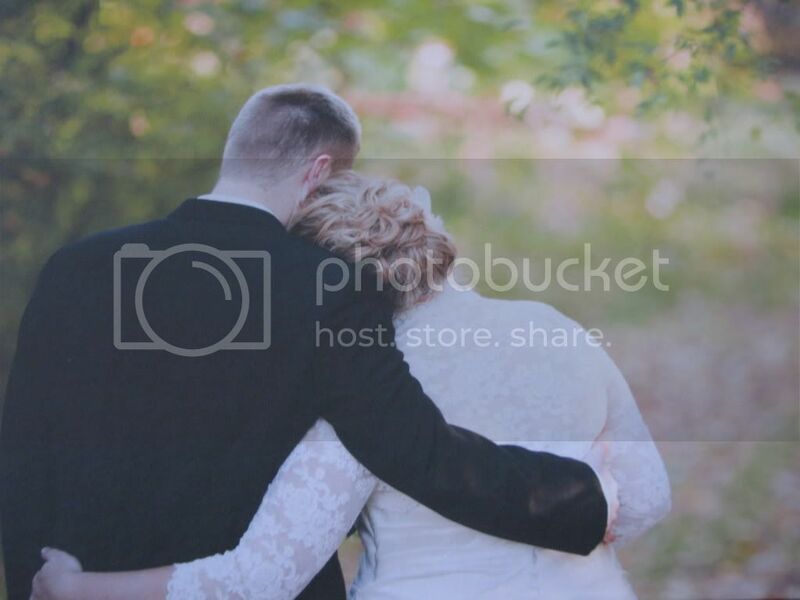 A couple more photos from the wedding. 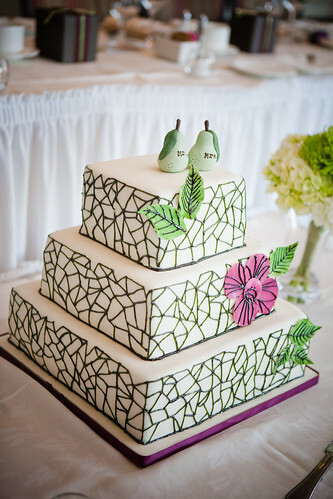 The wedding cake, please look at the wedding toppers, it goes with the theme "A Perfect Pair." 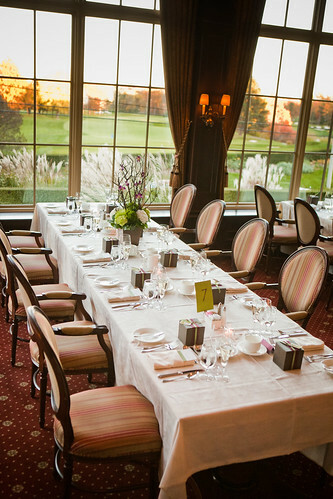 One of the tables in the venue. They overlooked the golf course and at night you could see the CN Tower (downtown Toronto) all lit up. The small brown boxes is the jam wedding favour. 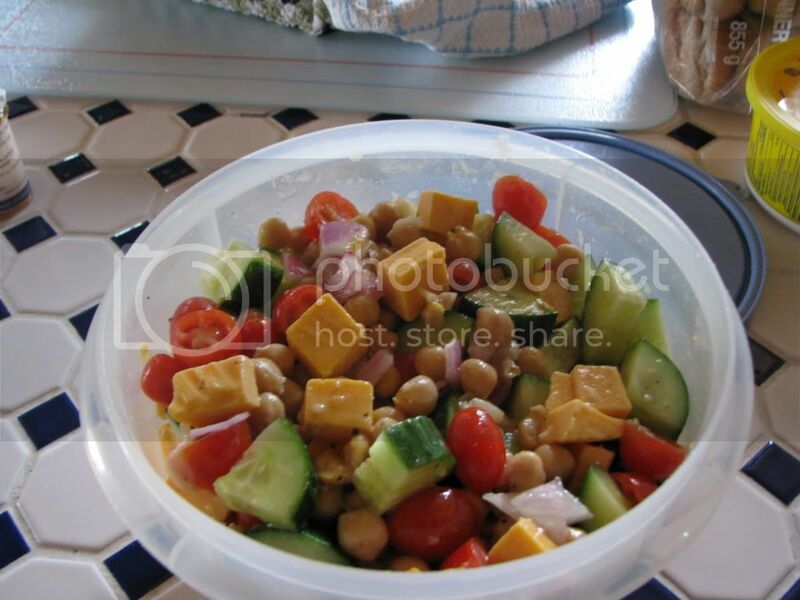 In a large bowl, combine chick peas, parsley, tomatoes, cucumber, onions and cheese. 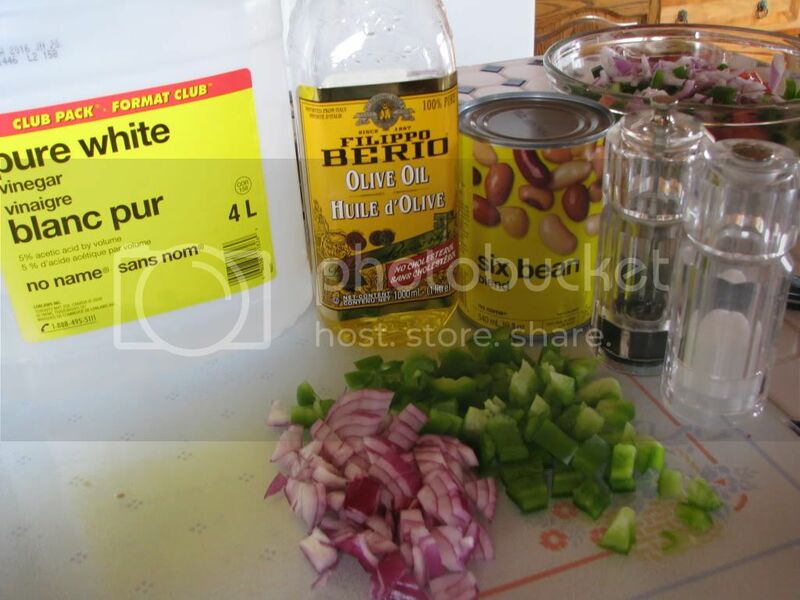 Mix together oil, vinegar, garlic and seasonings to make dressing. Toss dressing with salad ingredients. Cover and refrigerate for several hours. As with any recipes I post, change it up to suit you. I had a container of small grape tomatoes, so I used them, along with a whole cucumber. I didn't have parsley, or tarragon leaves, or dry mustard. So left them out. I also used red onion instead of the green onions and it still tasted really good in my humble opinion. For those of you who are following my grocery challenge, the tomatoes and cucumber were left over from the week before. I was asked yesterday for a photo of me in my dress for the wedding. 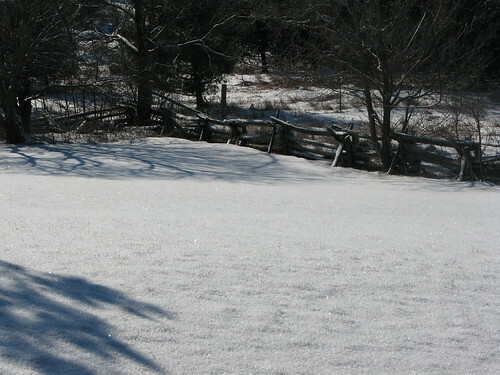 Dd does not want her photo on my blog, so I cropped her out of the photo. I was pretty impressed with myself that I was able to do that. Oh and the dress now is just above knee length as I had it shortened. 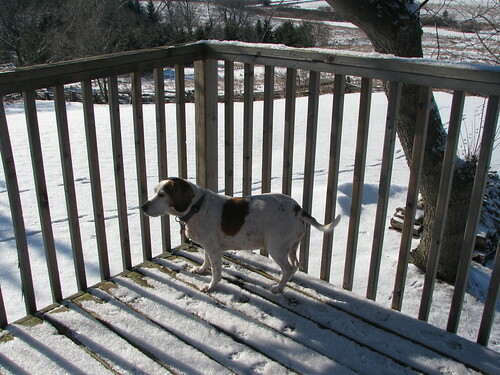 Carla over at 1/2 Dozen Daily is having two challenges for the month of February, a "Low (no) spend Challenge" and a "Decluttering Challenge." So I thought I'd get a jump start on it. Now what has that got to do with the photo below? In our living room since after the wedding has been the 8 stands you see in the photo with the flowers hanging off of them. I don't particularly want them, neither does dd. 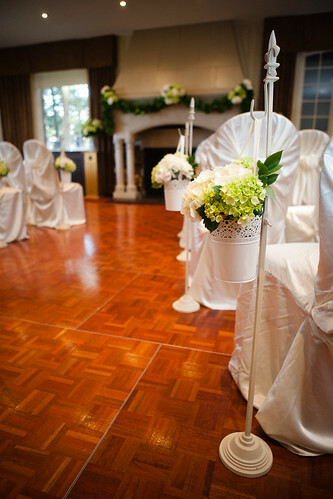 All the pots with the flowers in them, people took the night of the wedding. 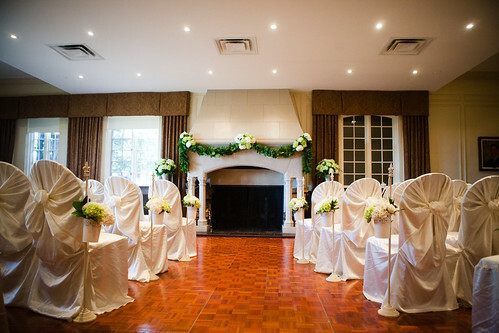 So I posted them on Kijiji on Tuesday, along with the aisle runner dd bought, monogrammed and then decided not to use. There is still 21 usable feet of aisle runner, so someone may find it useful. By the way the stands were from Michael's and were black. Dd spray painted them cream then over sprayed them with a stone effect paint. The containers that the flowers were in are from Ikea. The florist did the arrangements. That is part of the decluttering challenge. I feel I will have no problem completing that challenge. If you want to join up, just pop over and sign up for it. I am still having trouble commenting on people's blogs. One Simple Farmgirl, you're one of them. I can read your blog, but when I come to comment I get a white blank page and that is it? I have no idea what the problem is, hopefully Blogger will figure it out, or if anyone knows what is wrong could you let me know? Good news I am up to $30 in my Amazon.ca account thanks to Swagbucks!!!! Have another $5 to come and hoping to cash in my swagbucks before the end of the month for another $5. So I wrote myself a list for when I went grocery shopping. Had it all worked out to the penny.....well sort of. Wanted to take advantage of the bonus points at Shopper's Drug Mart and came out of there spending $71.84 and using $24.89 in coupons and earning another 20,040 worth of points. So far so good. I knew I had another $3.16 left out of my $75 budget so I popped into Zehrs to get some banana's and mushrooms, and spent $3.63. So I over spent by 47 cents this week. If I hadn't picked up two bunches of bananas I would have been under. So close but still so far, drat, drat and double drat. This week I stocked up on toilet paper, have enough stock piled for around six months now. Picked up a 40 bag box of garbage bags, which will last us a year. We only have one garbage bag and a water softener salt bag of garbage every other week. I didn't buy meat this week as using up in the freezer; and other than the bananas and mushrooms, we will be eating frozen veggies or fruit this week. I also remembered to update my side bars for the Shopper's Drug Mart and Grocery total challenges. I am still under budget for my weekly budget goal, but only just. Had at least three no spend days this week, and put money in all my various pots. Sorted out the tomato sauce I made on Saturday. 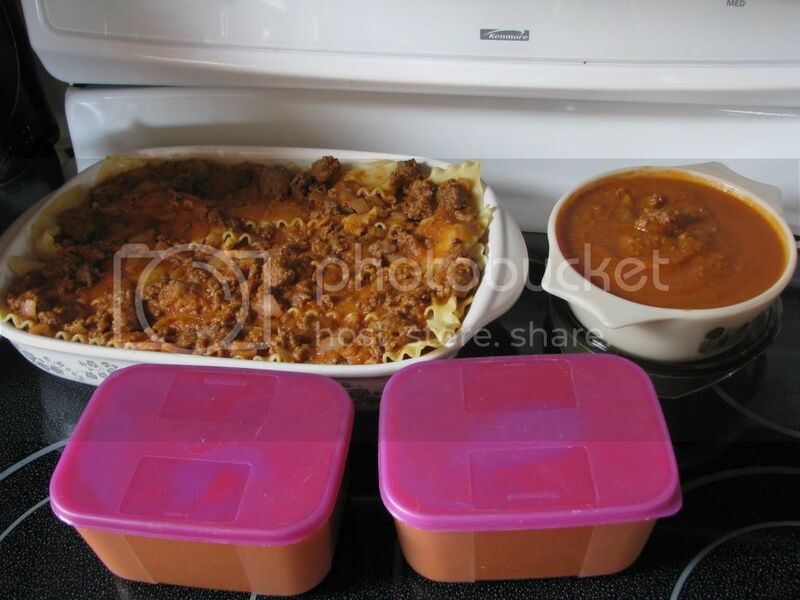 Put plain sauce in two 700ml Tupperware containers to freeze. Took out two packages of ground.minced beef and made a large lasagna, had hoped to make two but didn't have enough lasagna noodles for two, and bolognase sauce for two meals. I thought I had shared the lasagna recipe with you but I couldn't find it. It's a basic recipe but you can change it up any way you want. 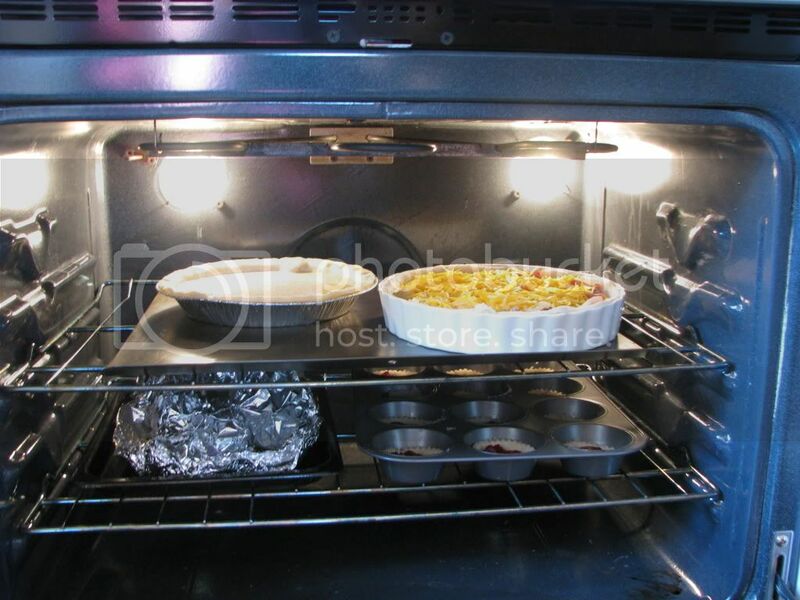 Preheat oven to 350 oF and grease a 13 x 9 inch glass baking dish. In a frying pan, cook beef and onion over medium heat stirring to break up meat until browned and onion is softened. 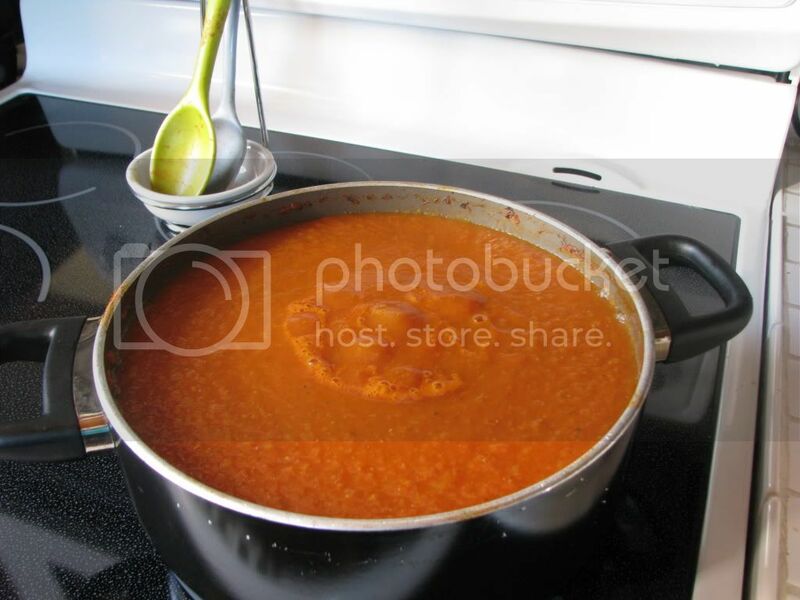 Drain fat from pan and stir in pasta sauce; bring to the boil and reduce heat to simmer and cook for 5 minutes. 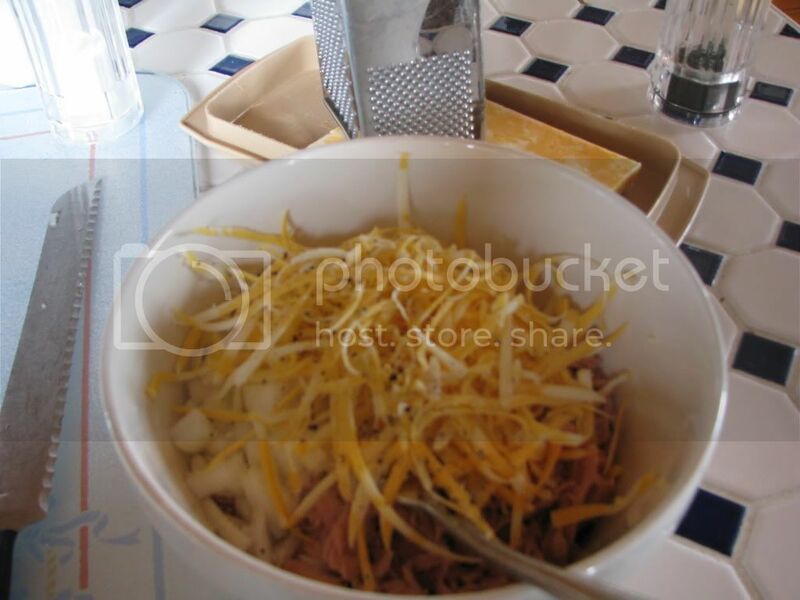 In a bowl stir together cottage and cheddar cheeses. Spread 1/2 cup of meat sauce over bottom of prepared pan. Top with 3 noodles, then 1/2 of the cheese mixture and 1/3 of meat sauce. Repeat noodle, cheese, sauce layers. Top with the last 3 noodles, remaining meat sauce and Parmesan cheese. Cover pan with foil. Bake in centre of oven for 30 minutes. Remove foil. Bake 15 to 20 minutes longer or until cheese is browned and lasagna is heated through. Let stand for 10 minutes before serving. It will serve four comfortably. I don't put my cheese on until I take the foil off. As I said before this is a basic recipe that you can alter to suit your taste. money on lavish parties and unearned bonuses, use the following plan. instantly, if they fell, or needed assistance. would have a code of conduct that would be strictly adhered to. to locate 125,000 illegal immigrants wandering around our country. grumpy old folk of Britain to speak up! Dd and hubby came for dinner last night so I made beef stew in the crock pot for dinner along with garlic bread, the Ace Bakery brand which is the best I may add. Have enough leftover for another meal and it was a perfect meal on a cold winters night. 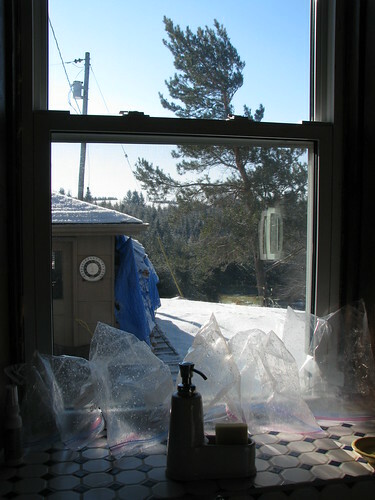 It freezes great, and I will use some today to make a couple of lasagnas, one for supper and one for the freezer. 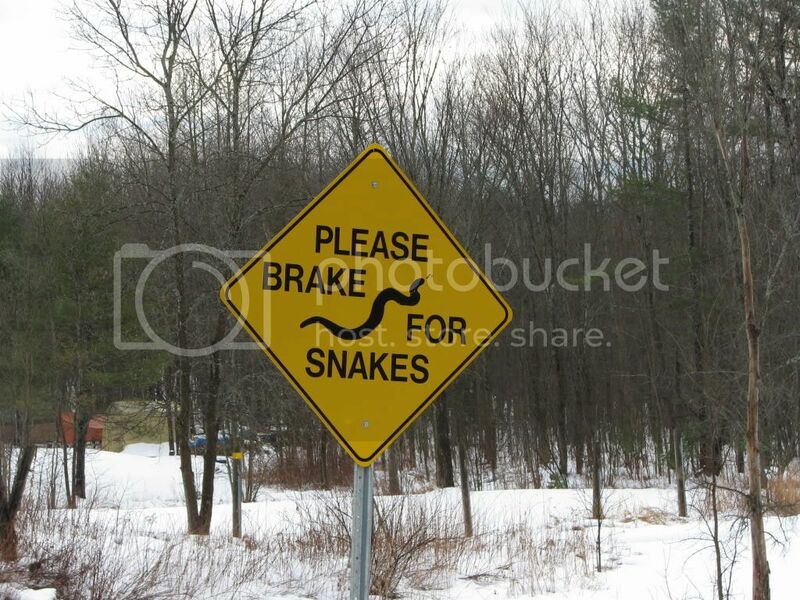 We were going through an Indian Reservation the other week as a cut through to another place and saw this sign. Luckily for me it was cold, so the snakes are all hibernating!! Good day to be alive!! This week's "Home of the Week," is so overpriced it's flipping crazy. It's only 45 minutes north of us and yes it's a lovely area, but is it worth 5 million, I don't think so. However please correct me if I'm wrong here. Also why call it a cottage? That is not a cottage it's a mansion. Then there is the condo of the week a "deal" at only 2.5 million!!!!! This looks as though someone got a deal on cream paint and furniture? Talk about bland and flipping expensive. Nice views though from the place and a large balcony for those not afraid of heights. I think I'll pass on this one as well!! Things are quiet around here. The weather is so up and down, you don't know whether you are coming or going with it. 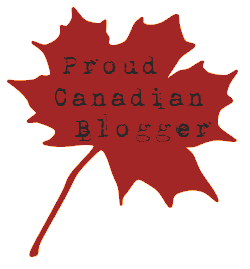 I have been hibernating and haven't been on the computer much, so I owe a lot of you comments on your blogs. My apologies, I hope to get around to it over the weekend. It's not something I do that often, in fact I only correspond on a regular basis with our next door neighbour in England; and by regular I mean I send a letter maybe four or five times a year. On Tuesday I sat down and wrote a letter to them; then while I was cleaning out a drawer I found another note card from an acquaintance in the States, so I also wrote a note to her. I went to the post office on Wednesday and discovered that the cost of mailing these letters has increased again. It now costs $1.80 plus tax to mail a letter to Britain, and $1.05 plus tax to mail a letter to the States. Even sending a letter in Canada costs 61 cents. With these prices I am guessing it is one reason that sending an email is so popular. Though I will say I find an email not as personal and would prefer people to call me to talk. Must admit though, it is nice to sit down with a cup of tea and a biscuit, reading a letter. Do you write letters or notes and mail to people? FYI: Shopper's Drug Mart is having a "Spend $75 and get 18,500 Points," this weekend. So hunt out your coupons and match them with the deals and earn those points. Oh, and don't forget to buy a Shopper's gift card first to pay for your groceries, and get points for buying it. I am hoping to use $10 worth of coupons, to bring my total including taxes below my $75 weekly budget. I got a "good freebie" on Tuesday. It arrived by Purolator. It's 96 Keurig cups of coffee. 48 of some Pumpkin Flavour and 48 of decaffeinated. One tiny little problem I don't have a Keurig coffee maker. However dd does and it's at our house along with her other wedding presents!! So I called her about my predicament and she said I could use her coffee maker. Isn't dd a trooper!!! Money mastery isn't hard when you know the rules. 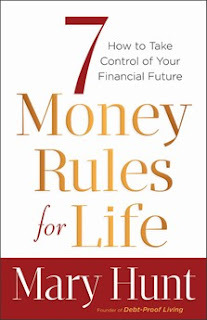 Let 7 Money Rules for Life change your future from uncertain to rock-solid--no matter what your income level. I have to say I am a fan of Mary Hunt's work, so was looking forward to reading and reviewing this book. In my humble opinion this book is good for those of you who are just realizing you have to do something about the way you spend your money and deal with your debt. For those of us who have been there and done that and have sort of figured it out, this book would be a refresher of what information you already know and maybe what you have stored in the back of your mind to pull out and use one day. I do prefer her other books especially "The Cheap-Skate Monthly Money Makeover" by Mary Hunt as that features more personalized stories and situations. Stars out of 5 : 4 not a bad book, very helpful and worth while buying or borrowing, as even if we think we know it all, we always have room to learn something new. Great site use it a lot. Good for both Canada and the States, it does bill in US Dollars and for us in Canada, it's shipped out of Southern Ontario and comes really fast. Not sure if you can use the following with the Groupon, but I do have TWO $7 off codes when you buy $35 worth of books. Just let me know if you would like one, by leaving me a separate comment with your email address in it, I won't publish it. First come first served basis. Want a quick dessert that takes no time at all to put together. Make cupcakes, use a packet mix. Cut a small scoop of cake out of the top of the cupcake (see photo). Fill in the hole with half a teaspoon of jam and top with a bit of frosting. 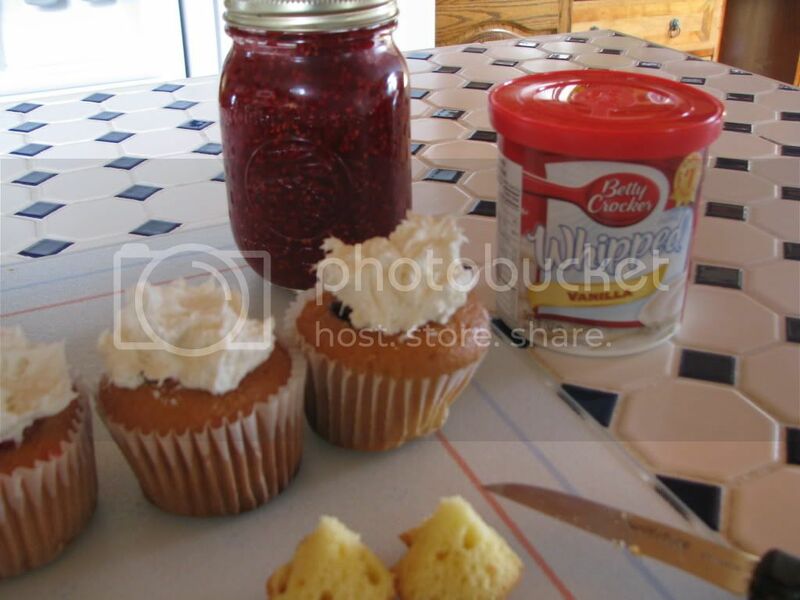 I like the Betty Crocker whipped frosting. Cut the scoop of cake into two and place on top of the cupcake. Sieve icing/powdered sugar over the top and place a small piece of glace cherry or a spot of red icing in the middle of the "wings." 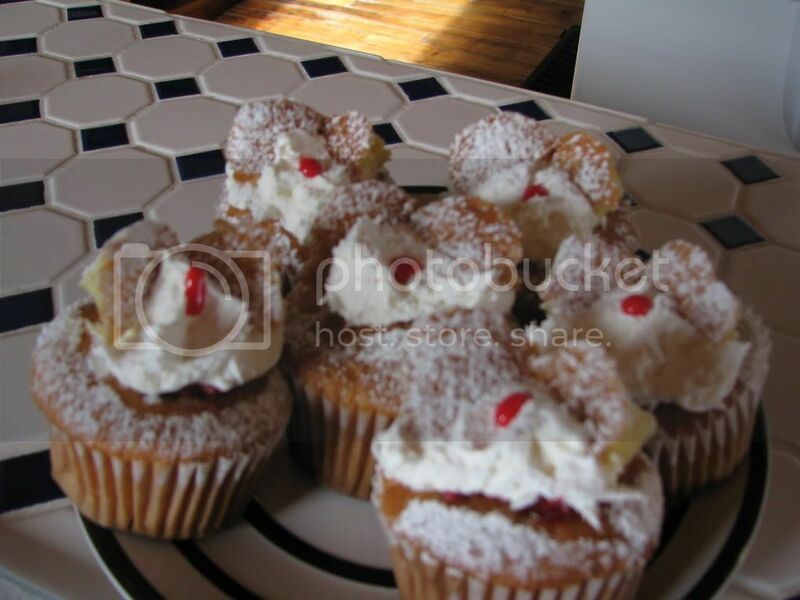 Butterfly buns or Fairy cakes are a standard cake in Britain. 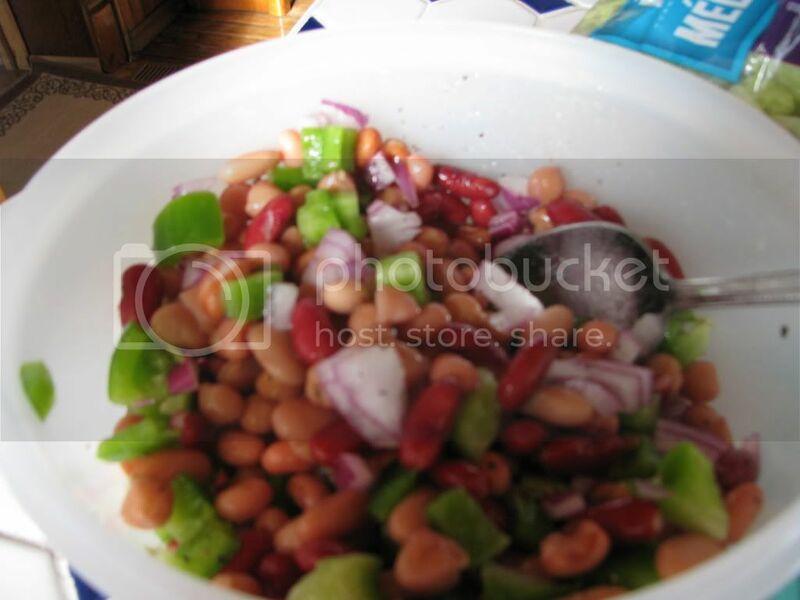 I made a quick bean salad the other day. Hey why not it was minus goodness knows what, so why not make salad on the coldest day of the year!!! Mix all the ingredients in a bowl. Put it in the fridge to let the flavours blend for an hour or so. Very tasty. Have you heard of Harlequin Books? They have a reader panel, that you can join and you answer surveys and occasionally they send out books for you to read and review. Here is a link if you're interested. So many thoughts twirl in my head...I want to think back as far as I can remember--think on things I had long ago buried and let stay buried. There were things I never told anyone. Now is the time to tell it, though. Help me remember it, Lord, so I can tell it just the way it was. 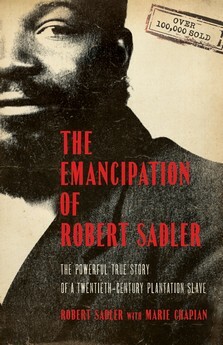 Over fifty years after the Emancipation Proclamation, Robert Sadler was sold into slavery at the age of five--by his own father. Originally published in 1975, this is the no-holds-barred tale of those dark days, his quest for freedom, and the determination to serve others borne out of his experience. You won't forget this poignant true story of good triumphing over evil, of God's grace, and of an extraordinary life of ministry. This is one book I would say you must read as it is a true eye opener. For a start who in their right mind sells their children into slavery in 1916 for $85? What sort of Father does that? Who treats their slaves as though they are animals by mistreating them? This true story will make you shake your head with astonishment time after time, after time. The book is split into three parts. Part one is about when Robert and his two sisters were sold into slavery to a plantation owner and what happens during that time. Part two is when Robert leaves/escapes the plantation and makes his way in the world. Part three is when Robert decides to devote his life to preaching about God and ministering to the less fortunate. Part's one and two were really interesting and thought provoking. Part three though I found hard to believe. Not that I am saying Robert wasn't telling the truth, I just found some of the things a bit far fetched for me. I found the cruelty of the plantation owners and the southern white people portrayed in this book just awful. This is so foreign to me as we were brought up to treat people of other nationalities and colours equally. I am not that naive to realize that racism and prejudices still occur throughout the world, this book made me think about it more. Stars out of 5: 5 A must read, and I think it should be on the curriculum in high schools as it is such a powerful and thought provoking book. If you don't read any other book this year, please try and read this, it really is worth while. Made a tuna braid the other day. 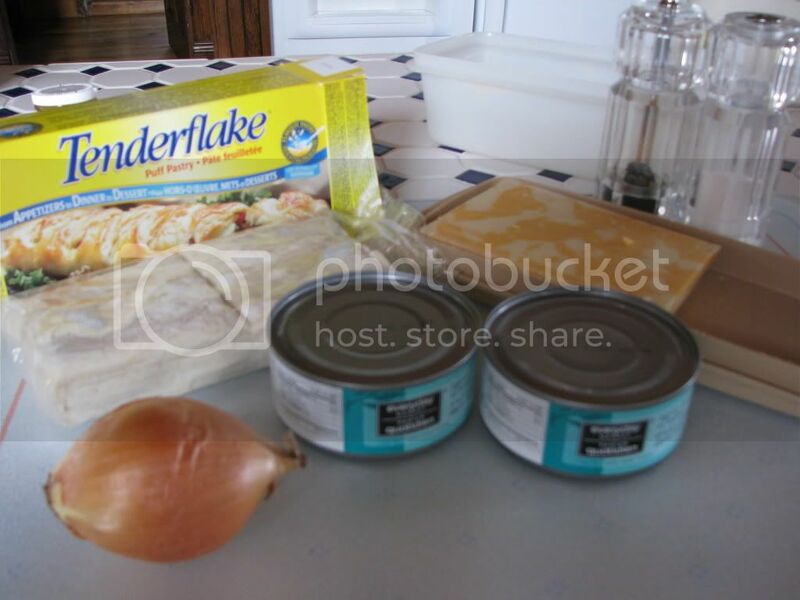 Mix together tuna, onion, cheese salt, pepper and lemon juice in a bowl - I didn't have lemon juice this time. Roll out pastry into a 16 inch by 10 inch rectangle, all sizes approximate. You could use regular short crust pastry. 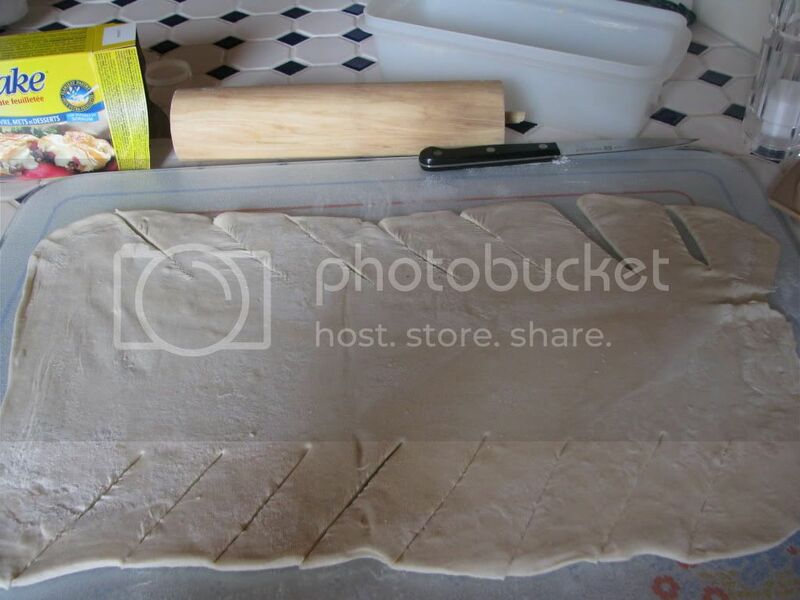 When you have rolled out the pastry slice the side of the pastry as in the photo below. 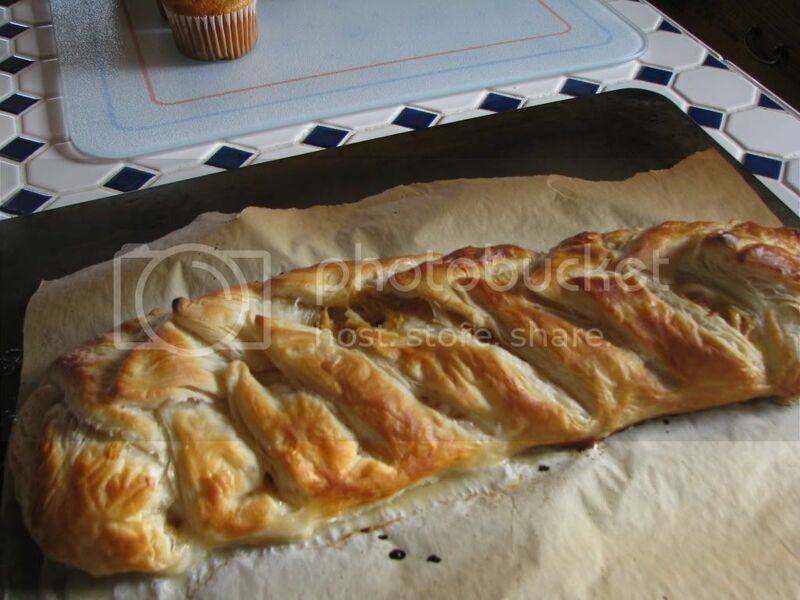 Put the tuna mixture down the middle of the pastry and braid the pastry over the top. Glaze the top with milk or egg and put into a 450 oF oven for around 25 minutes. Serve hot or cold. 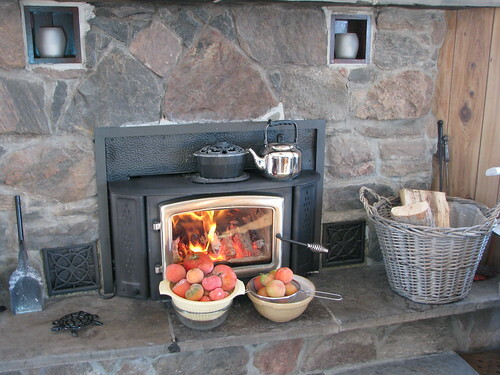 We had ours with garden salad and baked potatoes.